Berbere (pronounced bur-bur) is more than just a spice for us Ethiopians wherever we live from Sweden to Addis to Oakland or DC. All Ethiopian restaurants have it, of course, but more importantly it's in homes. With every Ethiopian arriving in a new city comes this gold; berbere is always spicy, but milder than its cousin, mit mita, and spices up the everyday cooking for Ethiopians around the world. I make my own and my wife, Maya, laughs that it's not good enough. Her sister sends us authentic berbere and the one I make is called "ferenge berbere" meaning, "nice try, but this is foreigner's berbere." 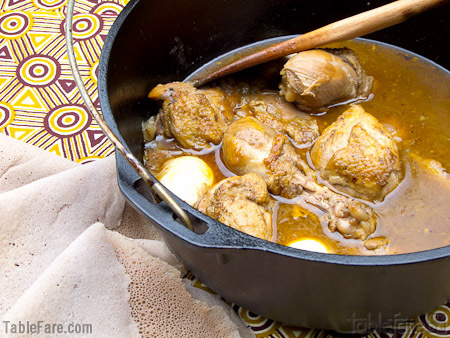 When we run out of the "good stuff" we use mine and she likes it for cooking at home, but prefers her sister's berbere when she makes the classics, and for us that's doro wat (chicken stew) and tibs wat (lamb stir fry). To understand, you have to realize that berbere is in our blood. Everywhere you go in Ethiopia people are sun drying and blending chilies, and when the rain comes you just take it in. Like wine, berbere has terroir, a taste of the unique earth that the chilies came from. Whether the chilies are grown next to a coffee plant or by the side of the road a there is a special quality that defines each one. The chilies are always blended with artisan skill into a bright red powder that is used generously in Ethiopian cuisine. It's not like a sprinkle of salt and pepper, berbere is used by the tablespoon, giving texture to sauces made from q'ibe (spiced butter). At Mercato in Addis, the largest open air market in Africa, you can buy it from specialists like Berbere Bet (meaning house of berbere in Amharic), where they live and breathe berbere. As soon as I land in Addis, I see the red clay and smell berbere; both make the long trip worth it. If a trip to Mercato isn't in your future, you can make your own berbere from my recipe featured in The Soul of a New Cuisine . 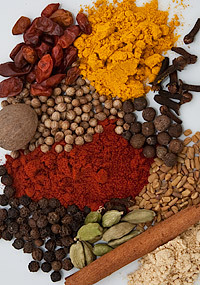 I also sell berbere spice in my Afrikya Foods line of products sold online through Flavorbank. My second cookbook, The New American Table , explores the cultural influences and culinary traditions influencing modern regional cuisines across the U.S.
At the age of 38, Marcus Samuelsson has received more accolades than many chefs receive in a lifetime. A graduate of the Culinary Institute in Gothenburg, Samuelsson apprenticed in Switzerland, Austria, France and the U.S. In 1995 he was hired as Aquavit’s Executive Chef. Just 3 months later, Aquavit received a three-star review from The New York Times. Samuelsson was honored with the James Beard Foundation Award for ‘Rising Star Chef’ in 1999 and ‘Best Chef, New York’ in 2003. He was also celebrated as one of “The Great Chefs of America” by The Culinary Institute of America. Samuelsson has been featured in numerous national publications and television programs. Samuelsson is also the co-founder and chief creative director of Townhouse Restaurant Group, a restaurant management and consulting company with projects in the US and Europe, including New York City’s Riingo, AQ Kafé, August as well as Chicago’s C-House and Marc Burger. He is the author of four successful cookbooks, including Aquavit and the New Scandinavian Cuisine (2003), Aquavit c/o New York (2004), En Smakresa med Marcus Samuelsson (2002), and Street Food (2004). His cookbook, The Soul of a New Cuisine: A Discovery of the Foods and Flavors of Africa , was released in October 2006, and has received accolades from publications such as The New York Times, the Chicago Tribune, and the Washington Post, and winning ‘Best International Cookbook’ from the James Beard Foundation in 2007. In 2007, Samuelsson became the first chef to collaborate with Starbucks coffee, delivering bakery items and coffee blends. Samuelsson serves on the Board of Directors of Careers Through Culinary Arts Program (C-CAP), and is an ambassador for the U.S. Fund for UNICEF. In 2005, Samuelsson was appointed Visiting Professor of International Culinary Science at the Umeå University School of Restaurant and Culinary Arts, and received an honorary degree from Johnson & Wales University as Doctor of Culinary Arts in 2006. 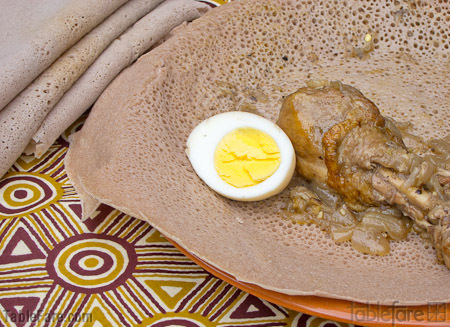 I have long been a fan of Ethiopian food and luckily we have lots of great Ethiopian restaurants in Seattle. It wasn't until David and I took a trip to Zambia to visit friends who were living there that I had a strong desire to explore cooking African food. I seem to have a habit of enthusiastically embracing the cuisine of our vacation destinations once we return; maybe it's my way of staying connected to our travel experience. 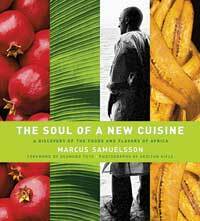 About this same time Marcus Samuelsson's book, The Soul of a New Cuisine: A Discovery of the Foods and Flavors of Africa, was published. It is one of the books listed in the Essential References section on our website and as I mention there, if you haven't cooked African food before this book will spark a new cooking romance. The stories and photography impart as much flavor as the recipes. Having no personal connection to African food or culture beyond liking what I have eaten in restaurants and visiting one tiny spot of the vast continent for a mere two weeks, I was thrilled to discover that it's possible to successfully explore the cuisine with great results in my own kitchen and even begin to develop a sense for the spices, flavors and techniques. With my first venture into cooking from this book I made berbere and nit'ir quibe (spiced butter). Before I was even finished making them my brain was processing ways to use these vibrant flavors in the food I cook on a daily basis. Berbere is now a spice drawer staple that finds its way into all kinds of dishes from simply rubbing it on meat to be grilled, sprinkling it over potatoes to be roasted, or boosting the flavor of a slow- simmered soup. The first time I made spiced butter I hopped around the kitchen with joy; the potential of this beautiful golden liquid made my head spin and my heart race. I have made dozens of dishes from The Soul of a New Cuisine and haven't had a single flop. Making the spongy bread, injera, is a little tricky and mine isn't as good as what I get in restaurants, but it's doable and a fun challenge (though I'd love to take credit for the beautiful injera in the photo, I bought it at a local Ethiopian market).I am grateful that Marcus Samuelsson made this cuisine accessible to me through his book, and I hope his Spice Inspiration will entice you to explore cooking with berbere and making the classic Ethiopian dish, Doro Wett. The deep spicy flavors of this simple chicken stew may just set you off on a grand cooking adventure! His newest book, The New American Table, shares stories of people and food from his travels across America. I look forward to seeing the flavors, foods, stories and photos of this country, that I do share a cultural bond with, from the perspective of this very talented chef. In June 2010, Marcus Samuelsson won the title of Top Chef Masters. Competing for his charity of choice, The UNICEF Tap Project, his success will help to bring clean drinking water to people around the world. Congratulations chef! Visit www.marcussamuelsson.com for the latest news on Chef Samuelsson's ventures.